Are you ready to feel more alive, aware and deeply connected to yourself and the world? Do you want to live passionately, love freely and go deeper within? Do you want to immerse yourself in the healing power of Yoga? Join Kate Middleton and the Gili Yoga team for over 200 Hours of training in Yoga and Meditation. This is a Yoga Alliance accredited month of inner alchemy weaving the potent practices of the ancient Yogic traditions with modern psychology and embodiment practices to facilitate life-changing immersions in Yoga, Meditation, Freediving and Authentic Living. Experience lasting personal transformation, develop your yoga practice and find your voice as a teacher. 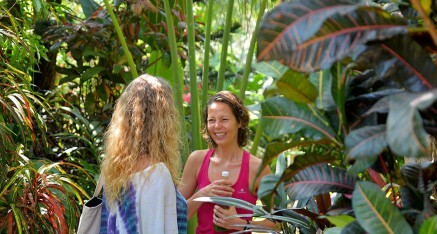 Hi- I’m Kate, lead teacher and Founder of Gili Yoga. Facilitating Yoga Teacher Trainings is my greatest passion. It’s an honor to lead immersive experiences in Yoga, Meditation, Freediving and Authentic Relating as these practices have been the most transformative and empowering explorations in my own life. The emphasis on the training is Hatha Yoga in the style of Embodied Flow. Embodied Flow is an integrative blend of hatha yoga, somatics, movement meditations, tantric philosophy, and transpersonal psychology that elicits the experience of stepping into flow as meditation in action. In this style of Yoga we explore Vinyasa, Yin, Ecstatic Dance, Expressive Arts, Relational Meditations, Freediving (and so much more) as deep spiritual practices. It is my intention to guide deep explorations in what it means to be awake, aware and engaged in life. I believe in challenging comfort zones, venturing into the unknown and celebrating growth and aliveness in community. Our month long 200 Hour Yoga Teacher Training is a deep dive into self study, embodied practices and conscious community. This program lasts 28 days. There will be 1 full day off each week for you to explore the island, absorb all of the information and integrate the practices. Are you ready? Dive in! Here is a sample schedule of a day on our Yoga Teacher Training. Please note that this schedule is just an example and is subject to change. The Yoga Garden at Gili Yoga is a sanctuary of peace in the heart of Gili Trawangan. Our rooms are set in our tropical garden, surrounding the beautiful yoga shala so that you may wake up and step straight into your morning practice. All of our rooms are modern and charming with cleanliness and comfort being a top priority. Our rooms all have Air Conditioning, hot and fresh water, wifi, Satellite TV, mini fridges, safety deposit boxes and even blackout curtains to ensure deep, healing sleeps. Our Teacher Training is an intensive program for those who are ready to dive in to the transformative teachings of yoga. The duration of our programs (28 days) give you time to learn, practice, evolve and build confidence in your teaching before taking it onwards and upwards from here. We believe that the length of our trainings ensures a comprehensive program that allows time to integrate, study, practice and even enjoy island life outside of the yoga shala. We are the only teacher training in the region committed to a small group experience. We take a maximum of 20 students for an intimate group feel and plenty of individualised attention. This helps us to connect on a deeper level as a group and it gives you more time to practice teaching. We ensure a high quality program at a very competitive price. Our residential pricing includes full tuition, your YTT Manual, accommodation for the duration of your training in our beautiful yoga sanctuary and a daily healthy, breakfast. We are offering our accommodation at up to 50% off our regular rates for our Trainees so that you may enjoy the best environment for learning and teaching. Residential places are likely to sell out first as we have a total of 9 rooms (two twin and seven doubles) so I recommend reserving sooner rather than later if you wish to stay onsite. Are you feeling the call? Sign up today and secure your place! Are you hesitating? Do you have questions about whether you are ready to teach yoga, or even if you really want to teach yoga? Check out our latest blog posts on those subjects here!